On 20 May 2015, Mr. Mircea Ciopraga, Secretary General of the PS IGC TRACECA met with Mr. Zhenis Kassymbek, Chairman of TRACECA National Commission in Kazakhstan, first vice-minister of the Ministry of Investments and Development of the Republic of Kazakhstan. Mr. Kassymbek and Mr. Ciopraga discussed the issues of TRACECA future, main priorities as well as exchanged views on the institutional development and transformation of TRACECA into international organization. Kazakhstan Party strongly supports the TRACECA transformation into an international organization for its more successful functioning in the future. It was noted that there should be a deep analysis of the consequences followed by this transformation process. For the purposes of comprehensive elaboration of TRACECA development strategies Mr. Ciopraga emphasized the necessity of creating a Legal Working Group to include the relevant experts of TRACECA member-states of the MLA TRACECA as well as experts from Kazakhstan. At the same time, Mr. Ciopraga was informed about the program of the President of the "Plan of the nation - 100 concrete steps to implement the five institutional reforms." 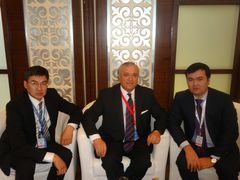 Kazakhstan Party believes transformation of TRACECA into an international organization is very timely and also reflects the point of the program "100 steps" for the integration of Kazakhstan into the international transport and communication flows. Completed and ongoing EC technical assistance projects in the field of aviation, road and maritime fields, as well as financing of the TRACECA Programme and projects were in the Agenda and focus of the meeting. During discussion the Parties mentioned the importance of step-by-step plan of activities for next 5 years. TRACECA member-countries focus on the idea of transport corridors’ extension across the sea and connection of sea routes with main internal transport nodal points. On the meeting Mr. Kassymbek supported the opinion of Mr. Ciopraga that it is very important for the member-states of the IGC TRACECA to maintain a constructive partnership dialogue with China right up to accession of the Peoples’ Republic of China to the TRACECA Basic Agreement. In this context, one of the most perspective and complex areas will be the project for creation of “Silk Wind” block train which will include a new transport infrastructure of the member states providing a full complex of logistic services from China to Kazakhstan and further to Europe. This route is also attractive for the EU countries – the main consumer of Chinese commodities – being the shortest way of goods delivery from PRC to the EU borders via continental route.